A non-cash expense (also known as non-cash charge) that provides a source of free cash flow. Amount allocated during the period to amortize the cost of acquiring long-term assets over the useful life of the assets. To be clear, this is an accounting expense not a real expense that demands cash. The sum of depreciation expenses of prior years leads to the balance sheet item Accumulated Depreciation. The gradual reduction of an asset's value. It is an expense, but because it is non-cash, it is often effectively a tax write-off; that is, a person or company usually may reduce his/her/its taxable income by the amount of the depreciation on the asset. Because there are many different ways to account depreciation, it often bears only a rough resemblance to the asset's useful life. This may further benefit the company as they may continue to use the asset tax-free after its value has technically depreciated to nothing. See also: Amortization. The periodic cost assigned for the reduction in usefulness and value of a long-term tangible asset. Because firms can use several types of depreciation, the amount of depreciation recorded on corporate financial statements may or may not be a good indication of an asset's reduction in value. Depreciation not only affects the asset's value as stated on the balance sheet, it also affects the amount of reported earnings. See also Accelerated Cost Recovery System, accelerated depreciation, accumulated depreciation, recapture of depreciation, straight-line depreciation. Certain assets, such as buildings and equipment, depreciate, or decline in value, over time. You can amortize, or write off, the cost of such an asset over its estimated useful life, thereby reducing your taxable income without reducing the cash you have on hand. Fig. 33 Depreciation. 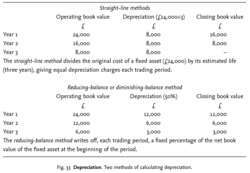 Two methods of calculating depreciation. the fall in the value of an ASSET during the course of its working life. The condition of plant and equipment used in production deteriorates over time and these items will eventually have to be replaced. Accordingly, a firm needs to make financial provision for the depreciation of its assets. Depreciation is an accounting means of dividing up the HISTORIC COST of a FIXED ASSET over a number of accounting periods which correspond with the asset's estimated life. The depreciation charged against the revenue of successive time periods in the PROFIT-AND-LOSS ACCOUNT serves to spread the original cost of a fixed asset yielding benefit to the firm over several trading periods. In the period-end BALANCE SHEET such an asset would be included at its net book value (cost less cumulative depreciation deducted to date). This depreciation charge does not attempt to calculate the reducing market value of fixed assets, so that balance sheets do not show realization values. Different formulas used to calculate depreciation can lead to variations in the balance sheet value of a fixed asset and in the charge against GROSS PROFIT for depreciation. The second formula in Fig. 33 gives a large depreciation charge in the early periods of the fixed asset's life and a small charge in the later years (accelerated depreciation). In the interests of consistency, firms generally do not change the depreciation formula used for their fixed assets but stick to the same formula indefinitely. All these depreciation formulas base the depreciation charge on the historic cost of fixed assets. However, during a period of INFLATION it is likely that the REPLACEMENT COST of an asset is likely to be higher than its original cost. Therefore, prudent companies need to make PROVISION for higher replacement costs in the form of a REVALUATION RESERVE. See INFLATION ACCOUNTING, CAPITAL CONSUMPTION, APPRECIATION, CREATIVE ACCOUNTING. a decrease in the EXCHANGE RATE of a currency against other currencies under a FLOATING EXCHANGE RATE SYSTEM, reflecting a fall in market demand for that currency combined with a rise in market demand for other countries' currencies. The effect of a depreciation is to make imports (in the local currency) more expensive and exports (in the local currency) cheaper, thereby assisting in the removal of a BALANCE OF PAYMENTS deficit by acting to reduce import demand for goods and services and increasing export demand. Depreciations, like DEVALUATION, provide firms with an opportunity to expand sales and boost profitability by improving their price competitiveness in both home and export markets. See DEVALUATION for further discussion. Contrast with APPRECIATION, definition 2. See EXCHANGE RATE EXPOSURE. Fig. 43 Depreciation. 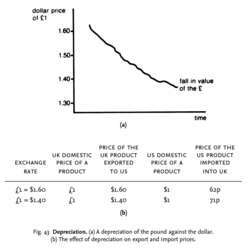 (a) A depreciation of the pound against the dollar. (b) The effect of depreciation on export and import prices. INTEREST is payable on deposit accounts, normally at rates above those paid on current accounts, in order to encourage clients to deposit money for longer periods of time. Unlike with a current account, cheques cannot generally be drawn against deposit accounts. See BANK DEPOSIT. finally, a crucial requirement in underpinning the ‘success’ of the above factors and in maintaining long-run equilibrium is for there to be a real improvement in the country's industrial efficiency and international competitiveness. (See ADJUSTMENT MECHANISM entry for further discussion.) See BALANCE-OF-PAYMENTS EQUILIBRIUM, INTERNAL-EXTERNAL BALANCE MODEL, PRICE ELASTICITY OF SUPPLY. the fall in the value of an ASSET during the course of its working life. Also called amortization. The condition of plant and equipment used in production deteriorates over time, and these items will eventually have to be replaced. Accordingly, a firm is required to make financial provision for the depreciation of its assets. Depreciation is an accounting means of dividing up the historic cost of a FIXED ASSET over a number of accounting periods that correspond with the asset's estimated life. The depreciation charged against the revenue of successive time periods in the PROFIT-AND-LOSS ACCOUNT serves to spread the original cost of a fixed asset, which yields benefits to the firm over several trading periods. In the period end BALANCE SHEET, such an asset would be included at its cost less depreciation deducted to date. This depreciation charge does not attempt to calculate the reducing market value of fixed assets, so that balance sheets do not show realization values. Depreciation formulas base the depreciation charge on the HISTORIC COST of fixed assets. During a period of INFLATION, however, it is likely that the REPLACEMENT COST of an asset is likely to be higher than its original cost. Thus, prudent companies need to make provision for higher replacement costs of fixed assets. See INFLATION ACCOUNTING, CAPITAL CONSUMPTION, APPRECIATION ?. ish the building, write off $3,000,000 against income for that particular year, and then construct another building or move. (2) In appraisal, a reduction in the calculations for the reproduction cost of an improvement, in order to arrive at a value of the improvement in its current state, not as it would be if it were reproduced and brand new. Depreciation is the deduction for the reasonable allowance for the wear and tear of assets with a life of more than one year, including real estate but not inventory, used in a trade or business or held for the production of income. Empirical studies of the form of the relationship between depreciation and property age are, at best, inconclusive. Regular tax depreciation may be computed using either of two systems, the General Depreciation System (GDS) or the Alternative Depreciation System (ADS), both of which are part of MACRS. Secondly, any further and more significant rupee depreciation will increase inflation to double digits, causing bigger and earlier hikes in interest rates. However, these improvements are qualified improvement property placed in service after the building was placed in service, qualifying for 50% bonus depreciation in 2016 when placed in service, assuming all other requirements for claiming bonus depreciation are met. For achieving our goals, we used a deductive and inductive constructive methodology to identify the proper accounting and fiscal treatments on recording resumption of losses from depreciation, as a factor that influences, significantly, the entities' performances for acquiring investments, choosing the legal form and the object of activity. In the case of calculated diminishing depreciation allowances (higher in the first half of its life and smaller in the second half) obtained tax savings during the first years are more important in the value of the company than its losses in recent years. The treatment of bonus depreciation may be different at the state level than the Federal. This is because all the recognized gain would be attributable to the useless tax depreciation deductions that reduced the asset's basis (3) below its original cost (hereinafter referred to as the "Basis Reduction Tax Trap"). All other categories of assets like buildings, aircraft, ships, would continue to be entitled to depreciation on a straight line basis. In year 2, the same 20% is multiplied by the remaining $8,000 of book value to come up with depreciation of $1,600. Businesses that qualify for the section 179 enhancement can also take advantage of the 50-percent depreciation allowance on property they do not expense under section 179.